Hermell’s Deluxe Bed Lounger Pillow provides ergonomic support while sitting upright in bed reading, watching TV, gaming, and more! With cushioned arm rests, a softly padded back pillow, and adjustable neck support, the Hermell Deluxe Bed Lounger Pillow can be modified to your particular needs. Hermell’s Deluxe Bed Lounger Pillow is made from durable, high-grade polyurethane foam, weighing in at 7 pounds and measuring 21" x 21" x 27". 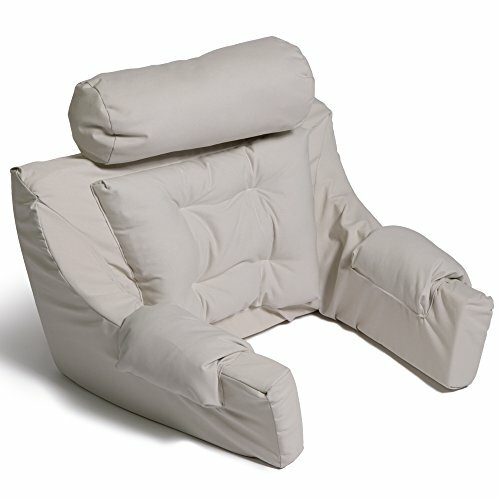 Made in the USA, Hermell’s Deluxe Bed Lounger Pillow comes with a removable twill cover that is machine washable.